We have a little widget for events, how about a little widget for the HxL timetable? I think it would be great as it could work the same as the events widget, giving people a quick way to see who is DJing next, or 3 hours later? What are peoples opinion? Is this even possible @lawrawrrr;? It wouldn't be bad but also a little pointless as habboxlive have the dropdown which is quite easy access to the full timetable. Events doesn't have this. Guess it'll not be a bad shout tho if it is doable. Hover over community tab > events > events today . 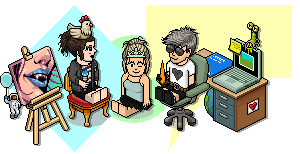 The DJ thing could work though, I think it was pointless before because we had the HabboxLive site to do all that. EDIT: If it's possible, they could also do this with the latest updated values as well. Last edited by Samantha; 23-08-2018 at 06:49 PM. yassss events does have this!!! We should probably put a little link on the events list saying "see all booked events" or something though to highlight it. Maybe we could do the same for HxL actually somewhere, jsut say "see next DJ" or something? Highlight timetable a bit more? Last edited by lawrawrrr; 23-08-2018 at 08:00 PM.